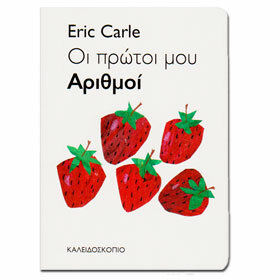 My Very First Book of Numbers, Oi Protoi mou Arithmoi, by Eric Carle. Can you tell how many cherries there are? How many apples? In the brilliantly colorful My Very First Book of Numbers, children can find the number of fruits in the bottom half of a page that matches the number of boxes and numerals in the top half. This new, bilingual edition will also allow them to match English and Spanish words for each. Children will love solving the puzzles of this clever, vibrant book.